It’s my last CES post (finally, I know), but I saved one of the more innovative ideas for the end. 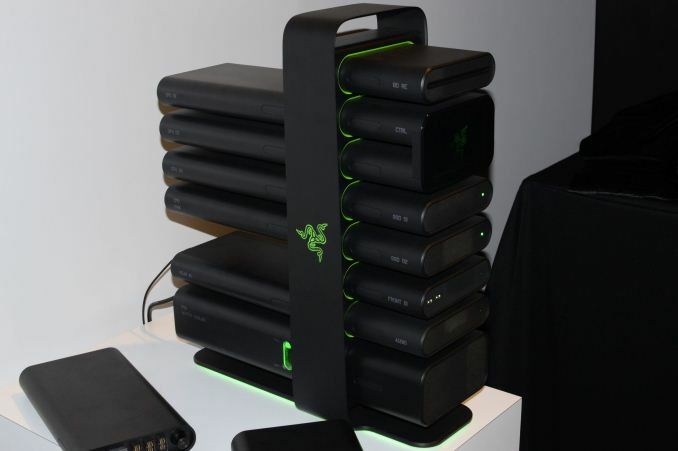 Coming courtesy of Razer, Project Christine ran away from CES with numerous awards and accolades. There were other items on display at Razer as well – like the “Nabu” wearable fitness band/smartwatch – but most of the products have already been launched so I won’t dwell on them. And as for Nabu, the idea isn’t bad but the early models shown at CES felt a bit too bulky/uncomfortable to me. The big news in my book was the modular PC, so let’s take a closer look at what Razer has created. First, it’s important to note that the two Christine prototypes shown at CES are apparently not functional (or at least, no longer functional after shipping? ), which is unfortunate as we would have loved to see a more real-world demonstration. Anyway, the idea is that you have this modular case (tower/column) where you can plug in GPUs, HDDs/SSDs, and other devices that come in self-contained modules. Need a faster GPU? No longer do you open up your PC and unscrew the old GPU and then install the new GPU; instead, you simply pop out the old module and add a new one – or in the case of CrossFire and SLI systems, you could simply plug in a second (or third?) GPU. Or perhaps you need more storage; simply pop in another SSD module and away you go. Take one look at the Christine prototype and you might start to wonder about cooling. Instead of air-cooling or even liquid-cooling, Razer is apparently using a non-conductive mineral oil that circulates through all of the modules (or at least the modules that need cooling I suppose), with as I understand it the parts being completely submerged in the oil. Presumably along with the GPUs, Power Supply, Storage, and other devices, one of the modules will likely need to be a pump + radiator. 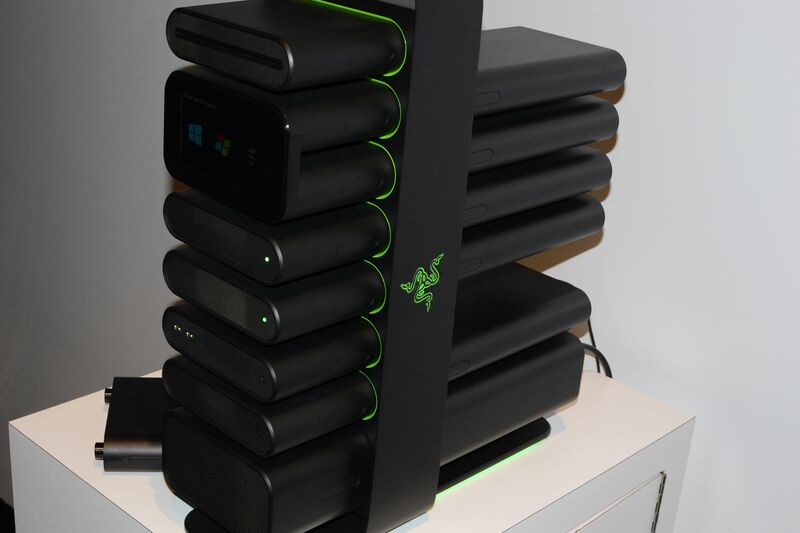 Again, it would have been great to see the PC actually running, but perhaps it’s not at that stage yet – though Razer indicated that there’s at least one working prototype that’s currently being used by their CEO. So far so good, but rerouting PCI Express lanes to custom ports isn’t really all that difficult (relatively speaking). Where things start to break down is when we get into the idea of adding more…let’s say “unusual”…parts. Swapping GPUs is easy enough, as we already do that with our “modular” desktop PCs. The same applies to storage devices as well as things that might plug into USB ports. But what happens if you want to upgrade your CPU or chipset? And what sort of RAM is supported and where is it located? RAM is usually in close proximity to the CPU, and one of the modules houses the CPU + RAM, so that solves that question (though it might make upgrading RAM a little difficult). But the location of the chipset wasn't disclosed (maybe it's in with the CPU and RAM? ), and I suspect in the prototype upgrading the chipset/platform simply isn’t possible. What would be really ground breaking would be a modular PC where you could easily swap any and all components. Maybe that’s something Razer is hoping to deliver in the future, but imagine having the center column contain a large PCI-E backplane that could be upgraded with various options. The default model might come with 24 or 32 PCI-E lanes, while higher end backplanes could boast 48, 72, or even 96 (or more!) lanes. Perhaps the chipset would need to be part of the backplane, or maybe not – certainly it would have to be something more than a stock chipset if it were going to support differing numbers of PCI-E lanes – or at the very least, it would have to have something like a PLX switch, which wouldn't actually doing anything for peak bandwidth. We could even have a design that could be upgraded to PCI-E 4.0 support in the future, and maybe something with the ability to transition between CPU platforms – so AMD, Intel, ARM, etc. That would take a lot of work and probably wouldn’t really receive much in the way of support from Intel, but it’s a nice dream. Ultimately, it’s an idea we’d love to see flourish, but we’ll have to wait and see where Razer goes with it. We could draw a parallel with the automotive industry and their concept cars, where all sorts of cool/crazy ideas are shown but few of them ever reach the point of mass production. Right now, we have plenty of questions and Razer isn’t really providing much in the way of answers. How much would the modular PC cost – for the initial base unit as well as for the component upgrades? When will it be available (if ever)? What’s the cooling capacity? How much (if any) noise does it make? How reliable would such a device be long-term? What about durability for frequent upgraders (or if someone happens to accidentally knock it over – I mention this as someone with a few children running around the house; I like my big, sturdy box, thank you very much!)? Even if the device may not be entirely practical, Razer has built a brand around somewhat niche products. Their peripherals have catered primarily to gamers since they first showed up, and the Razer Blade laptops are generally high quality designs if a bit expensive. The Project Christine prototypes felt pretty solid and it’s certainly an eye-catching design, though perhaps a bit too much so. If Razer brings in other partners or perhaps licenses the core elements, we might even end up with more traditional looking modular PCs that still provide an easier path to upgrades than our current devices. Now if we can just get something similar for laptops, I’ll be happy. "or even liquid-cooling, Razer is apparently using a non-conductive mineral oil that circulates through all of the modules"